In late July I traveled to the United States-Mexico border at Nogales, Arizona to get a first-hand glimpse of how the U.S. manages border crossings in contrast to those in Lampedusa. As you might imagine, the differences are on the surface, and quite stark. I’d call that contrast obvious (land versus sea, closed borders versus open), but that would imply an easy solution to amend what appeared to me as belligerence versus the feeling of neutrality you feel on the island. The border in the U.S. is militarized. The waves of intimidation that institution incites start long before you cross into the Nogales city limit. 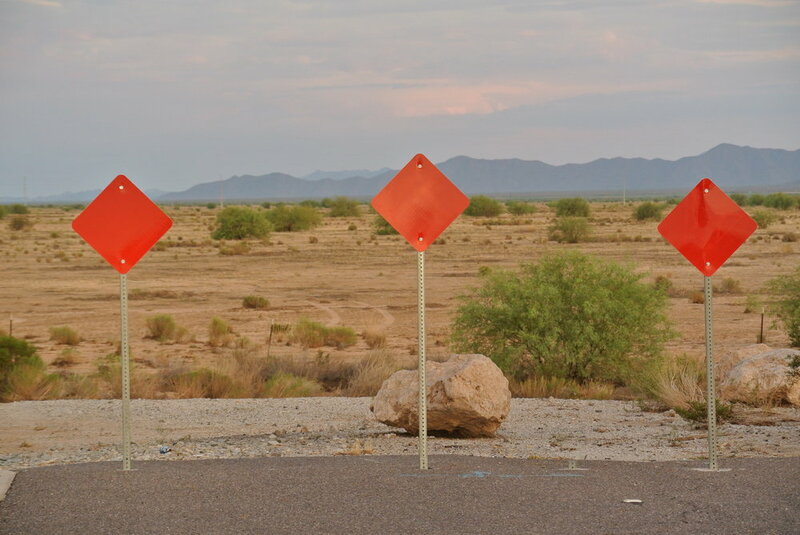 Along the I-19, the highway that runs south out of Tucson toward Mexico, security cameras are installed. A white tent big enough to double as an airplane hangar is propped up over the northbound lanes; a line of cars is queued for inspection. It took me by such surprise that I rubbernecked to confirm that what I was seeing was not a desert mirage. A heavy summer storm had rolled in. The last drops of its passing thunderhead pattered on the windshield at that droopy interval that makes wiper blades hiccup over the glass. Another storm was on its heels. It was just a wake of flat gray between two downpours now, and no sun in sight to stir the landscape to life. The desert appeared as a place of resting. Sage green brush and tall shoots of cacti bear witness to the sound of empty space, excepting the occasional sedan or tourist transfer van screaming by for an inch of time within eternity. The silence is something you can feel even from within the vibrating case of your car. There’s a feeling of being alone, or of abandonment, or of memory escaping. So you can imagine the surprise of realizing you are actually being watched. I flicked my head around after glimpsing the white tent, and a surveillance camera on the southbound side was looking me right in the face. I flinched. Some miles before or after in this deserted mesh of time, the boxy green guide signs we know on American highways begin converting the number of miles to Nogales into kilometers. It’s the first inkling that you’re on the brink of encountering something foreign; an experience, too, that must be uniquely American, since everywhere else in the world the measurement of distance is consistently the kilometer, and since there are only three other countries in the world (Russia, Canada, China) where you could drive as long as you can in this one and still stay within national territory. Here, we can be perfectly ignorant that another means of conceptualizing dimensions of space might exist. Americans stand apart from the rest of the world, insulated by our invented gauge in this way. Eventually the small pack of cars on the road breaks up as the I-19 dead ends and without fanfare trickles into the fray of Nogales. Lots advertising day and overnight parking rates line the entrance of the city that swings past a McDonald’s, as well as a Burger King, either always a reliable American orientation point. There’s a set of rail tracks cutting across town. On the other side is a slice of Back to the Future (1985) store fronts selling clothes and sundries. By the look of them, I’d guess they haven’t been updated since about the time my mom was a tween. The sidewalks are clear. It’s generally quiet. But there is tension from the way-finding mechanisms around town that have the subtext of asking, Well, are you going to go? Nogales does not feel like a place you stay put. It’s ironic, then, to see how bizarrely nestled-in the U.S. Customs and Border Protection agents have become in this liminal zone. At the edge of the rail tracks the road moves drivers to the Mexico port of entry. But I walked. I parked the car and headed toward the pedestrian port. The thunderstorm had started. I followed a winding path inside, wet from the rainfall being tracked in with shoes and umbrellas. There was only a single conveyor belt to slow my pace. My bag was cleared quickly enough to know the scan was perfunctory. I hopped a few puddles on the uneven concrete walkway. I pushed through a turnstile. I was in Mexico. I saw the city on foot. I dodged debris in the street and avoided slicks of mud made on the sidewalks by the rain. Sewage drains were overwhelmed from it. I turned my vision down a street and at its end, the wall. I was snapping pictures along the way of objects and scenes that had no interest in being framed as a site worth seeing. Some planted flowers blossomed in spite of the untamed sidewalk that looked like nobody went there except perhaps to plant those flowers. The wall was imminent. The wall may have been a normal site to the Nogales townspeople, but it was not to me. I was startled to confront an object of this much contention. I was startled to look at it levelly right in front of me, after so many years of filing it away as a thing that existed only politically, only as a figurative thing. The wall stood for something in this moment, but it was not political virtue, or even political vice––either of those were abstracts. What I was looking at was the manifest of fear. The wall is made of metal, steel, and its surface is coarse brown and oxidized. I imagined pieces of the wall decades or centuries later having been installed at a museum for our future selves to stare at in disbelief. I imagined looking at it as close as the security ropes would let me, peering into the pores of its material and projecting all of the scenes of short-sighted anger and dark age-ignorance I would have studied of this period of American history. I imagined how this xenophobic relic would have even looked beautiful in its neat display on the contrasting white gallery wall where it would be hung. Our future selves would have nodded to its presentation and shaken our heads at what it once did. And then something would have caught our eye in the other corner of the room, and as we walked away we would be latently relieved that this would not be something we would have to account for in our own lifetimes. Things are discarded at its side, objects and lives. I started to feel uneasy near it, out of sight of the more central goings-on around town. Being a newcomer to a border city alone with a camera is much like painting a target on yourself. The rain paused. A man who was stopped at the crosswalk with me made the neighborly nicety of remarking on the severity of the rain, and we went our separate ways. I walked through small brick-paved park spaces with benches, past churro and snack stands, a church, and through a maze of drugstores offering prescription-grade medications at discount and, here, right over the counter. The prescription drugs are a big tourist draw for Americans. Chartered bus services are offered from Phoenix or Tucson that will shuttle you over the border for a few hours to pick over cheap artisanias and blood pressure medications before you’re loaded up again and taken back to the city. Then I saw the city from the sky. I returned to my hotel room that overlooked the main street, and that faced the line of demarcation between my country and the one I was in now for one night. I ate the house special for dinner at a local restaurant, sipped a Mexican beer I had never heard of, bought a Snickers candy bar at a bodega that read “LOQUITO" on its front label, and went to sleep. I didn’t sleep well. Part was the worry of the safety of my mother’s car parked on the Arizona side in an open lot, which I could in fact see from my hotel room window. Part was suffering from what I suffer in the early hours and days of any travel I embark upon, which is a general feeling of disorientation. In the morning, I kept glancing out of the window at the hillside that formed the horizon: on one side there was a clearing, but on the other, toy-colored houses were stacked indiscriminately up the slope; in between was a black line. I slurped coffee over breakfast at my computer, and asked a woman at a nearby table how to better phrase something I was writing in Spanish. I waved through the glass to an acquaintance I had made at a shop the day before, and headed to the pedestrian port of entry to the United States of America. The crossing from Mexico into the United States mostly involves long lines that move slow. The man in line behind me said there was once no line at all, because there was no wall. He said border patrol agents complain they are understaffed now, but according to him, they just don’t want to do their job. He was happily vindicated when a group of them loitered in the open hall next to a closed customs desk that none seemed to have any urgency to open. The hall is at the end of the line, a concrete quarter that has all the charm of a boys’ locker room: echoes, uncirculated air, stunted emotional growth. It seemed, in retrospect, that all of that waiting is choreographed to induce anxiety in commuters. Waiting creates time to second guess yourself. Waiting suggests there’s still time to go back. Waiting suggests there’s something important being deliberated upon. I presented my passport at the open desk. The agent said nothing as he handed it back. It was no less perfunctory than the conveyor belt at the entrance to Mexico. I walked out the door. I was in the United States. I left Nogales, Sonora, Mexico and arrived in Nogales, Arizona, United States. Nogales to Nogales. It used to be a city undivided. I imagine it was a place of more vibrancy before the wall was put between them. The city, of course, used to be Mexico’s. I emerged onto a side street that ran parallel to the wall and started snapping pictures of it. I was spooked at its side again, just like I was the day before on the Mexico side, but for new reasons. Two men whispered past and said border patrol agents a few meters over would confiscate my camera when they saw me stealing these frames of government property, and advised me to get away while I could. I took one more shot anyway, but my hand wasn’t steady and it was blurry. I zig-zagged back to the center of town on random streets, at a stride fueled by the panic of being told my property was on the verge of seizure by my own government. But whoever I imagined chasing me was not there. I slipped into the offices of Kino Border Initiative/Iniciativa Kino para la Frontera (KBI), a non-profit migration organization in the city. It’s caddy-corner to the McDonald’s behind a facade so humble I had already walked past it once without seeing the sign on the door. I was scheduled to meet Joanna Williams, the organization’s director of Education and Advocacy. In her work with KBI, she witnesses the effects of this militarized land separation and its companion criminal deportation system directly on human beings as a regular part of the job. She told me there has been a 150% increase in parents being separated from their U.S. citizen kids since the start of the Trump administration. She told me before Trump, 80% of deportations were of people recently crossed; after, that figure has dropped twenty points, meaning 40% of deportees now consist of people torn from their own homes and communities in cities like Phoenix and Las Vegas, and others. So there is a mood being set for the general motions of life in the United States, and it is not one of ease. Hardliners would argue that unease is exactly the thing to scare undocumented migrants away; but I would remind them that they are not apart from the zeitgeist, and that the terror stoked in one leaves energy in the air that stokes the fear of the other. Of course, it doesn’t acknowledge the push factor for a migrant’s departure either: disenfranchisement, the threat of death, etc., factors that outweigh the potential consequences once they arrive. It was the parallels of the migrant experiences in Mexico and Italy that struck me most as I talked to Joanna. Discrimination by skin color, for example, consistently makes migrants a target along smuggling or trafficking routes: black West Africans entering paler-skinned North Africa and Libya is the same as Guatemalans and southern Mexicans with darker complexions standing out along routes in the whiter-skinned north as they veer toward the California, Arizona, or Texas borders. Racial exploitation remains a constant theme in any migrant story. As migrants are deported from the U.S. they are dressed in a standard blue shirt and pants, and a pair of navy blue slip-on tennis shoes, a knock-off of the skater brand Vans. They’re the same shoes African migrants receive from the Italian government after they’re processed at the hotspot in Lampedusa. Within each country receiving migrants there is also a sustained economy of businesses supported by them: as arrivals in Italy, as deportees in the United States. But in the U.S., because it criminalizes crossings, first with a misdemeanor charge, and a second offense as a felony, there is a prison economy. Joanna directed me to the U.S. District Court of Arizona in Tucson, where hearings for the aptly called “Operation Streamline” defendants are held each day, Monday through Friday at 1:30pm. Operation Streamline really does run like clockwork. It’s a rolling group of hearings that encompasses multiple defendants at once. When I visited on July 27 the largest group held seven men, but there have been groups ten times that size; it’s really a matter of courtroom capacity that decides how many might be heard on high-volume days. At a desk to the right of the judge’s stand is an interpreter with a headset. A door on the opposite side swings open and federal Marshals let in a line of defendants. None are dressed formally, just tee shirts and jeans, which stands out against the pressed pants and collars of the lawyers who immediately huddle to their sides. The defendants press headsets into their ears. “You have been charged with criminal complaint of illegal entry,” goes the judge. If it was a defendant’s second time crossing into the United States, he would announce the charge of “illegal entry of a removed alien,” a felony. This land is your land. Where humans merely setting foot on U.S. soil without a piece of paper will be considered criminals; where we say we don’t want these humans around, but might keep them locked in a prison here anyway, for up to years. There would be paper shuffling and clarifications made between lawyers and judge that made the process, for a first-time observer like me, feel extraordinarily unpretentious, even folksy as the judge would crack wise at his own forgetfulness that’s coming with his age. For all of the precision in presenting a case, you are still allowed to make a mistake, you only have to correct it for the record. The friendly pitch of the voices in the room didn’t match the march of letters across the U.S. Marshals’ black jackets, nor the language of the lawyers or the writ of Operation Streamline being announced to the twenty-six people that day who didn’t understand the language it was being delivered to them in. There was all this cushioning around something everyone seemed to understand as a bruising enterprise. No one actually seemed to endorse the humanity Streamline was taking away from migrants. There were actually big-hearted people across the implementation of it. Why was it still happening? The corridors of the courthouse have the crisp sterility of a hospital. The air-conditioning gives you a chill. Outside, in July, it’s hot enough to feel the warming rubber of your shoes from the asphalt under your feet. After the guilty offenders are announced, they will be taken to jail, or, as is the case for most, will be transported to a port of entry to Mexico. Nogales is one port, and that’s where Joanna will meet them. There was a story she told. A married couple from Mexico, husband and wife, who about a month before we met, attempted crossing the Sonoran desert beyond Nogales and south of Phoenix. The journey on foot takes about ten days, but they didn’t make it that long; they were picked up by the border patrol, sick. They were dehydrated and started drinking their own urine to survive. The woman was hallucinating when they found her. They were lucky. Joanna told the story of a migrant who went missing; his death was confirmed by his discovered remains found two weeks later. The Sonoran desert is so hot and dry that all it took was the space of two weeks to render them almost completely skeletal. “It’s physically impossible to carry enough water for more than about a day or two in the desert,” Joanna said. Migrants will resort to cattle troughs for water, and that’s usually what makes them sick––not the lack of water per se, but the advanced dehydration they face from diarrhea and vomiting caused by contaminated water sources. When I describe the crossing in each profile on Migrants of the Mediterranean, I choose to use the same phrasing across them all. “So-and-so crossed the Sahara desert in the back of a pickup truck with such-and-such number of people with X liters of water.” I do it to create cadence, so readers, even, including myself, can find a rhythm to connect to the space that none of us have ever seen. I’ve used the method to lay tracks in the ground, so we can start to recall what’s actually required of a person to migrate. The stories of Mexican and Central American migrants moving through the Sonoran don’t have the same cadence as the ones of Africans coming across the Sahara. The details of the journey are different, but the scene is still the same; through the Sonoran, the Sahara was pulled a bit more into focus. I was thinking about the volley of translations I had listened to being parroted back to the judge in the U.S. District courthouse on my way back to Phoenix from Tucson. He asked how they would plead. A beat; the interpreter would translate the question through his headset. Twenty six times. Culpable, guilty. Repeat. Twenty six federal criminals made new on a slow Friday in late July. As I left Nogales, the car cut across the desert and approached the tent shelter on the northbound side of Interstate 19. I stopped, staked out by fifty cameras collecting my profile in 360-degrees. A guard in green and shoulders erected from marble turned his head as I rolled down the window. “Have a great day!” he chirped. My little songbird in fatigues. Further down the road the signs change from kilometers back to miles. As I edged across the last deserted strip before the Phoenix city limits, an electronic remix on the radio repeated the chorus of Belinda Carlisle’s “Heaven Is A Place On Earth” so many times it started to sound like a desperate mantra. Its house bounce gunned so hard for us to agree that paradise was not lost. I pulled into the new development where my parents reside in a suburb west of Phoenix. It’s quiet there, which gives you the impression that beyond this community that sits flush with the desert’s fringe, lies nothing. The principal road that leads to their neighborhood was extended specifically for it, and it ends just a quarter-mile after its entrance. There are red reflective sign posts at the end to halt entry. But it’s just another border, invented, manufactured. On one side of it, you can sit in the silence and imagine nothing is there. On the other, humanity is screaming out for you to open your door and hear it.